New this year at Victorhill Farm, we planted lovely flowers all around the gift shop. We are so excited about how beautiful they all are that we just had to share them with you! 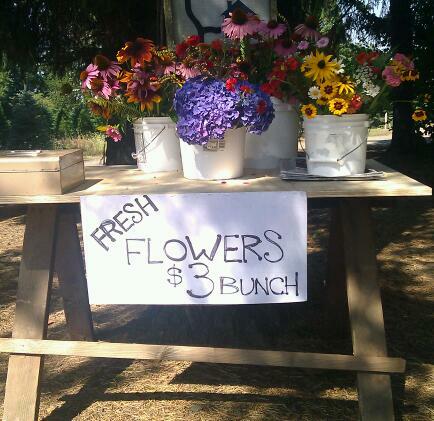 So we have opened a little self serve flower stand out by the end of the drive. The flowers are organic and local, straight from our garden to your table. And the price is right too, a sweet bouquet is only $3...what a deal! We'll keep the stand open as long as flowers keep blooming. By then it will be time for the holidays and all the excitement it brings. Erica and I are already planning a few new designs for Christmas wreaths, so stay tuned.